New smart and easy way to discover all the city and its beautiful surrounding hills. 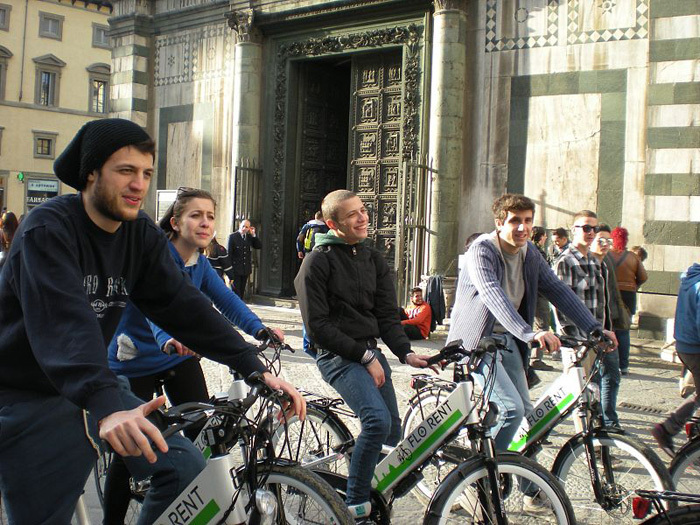 Electric Bike Tour of Florence and its Hills, from Fiesole to Piazzale Michelangelo, with typical tastings: an adventure between art, landscapes and Tuscan flavors – ideal for small groups. 59 € – Book Now ! 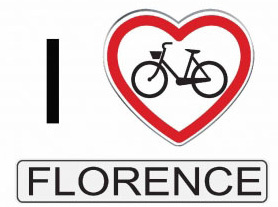 Admire Florence and its magnificent hills in an active and original way and be surprised using this new electric bike that allows you to see a lot with little effort! Anyone who knows how to ride a bike, though not in tip-top shape, can embark on this wonderful adventure with the help of the new technology ! 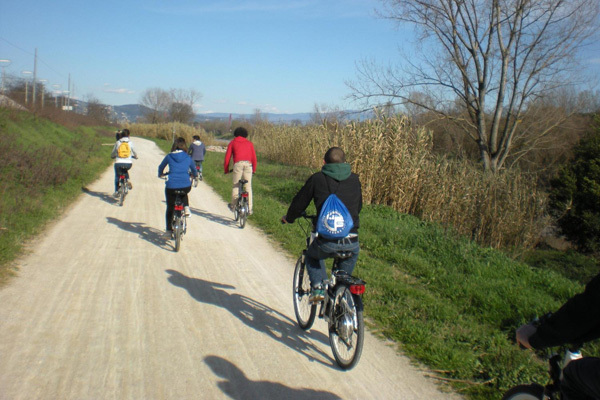 This slow-tour along bike lanes and safe streets is the ideal way to enjoy the best of the city and the countryside around Florence, with its stunning scenery and breathtaking views that will allow you to capture exceptional photos. A native Florentine tour leader will guide you on one of the most spectacular and charming hill tours available, where you will experience unparalleled views of the Tuscan countryside. 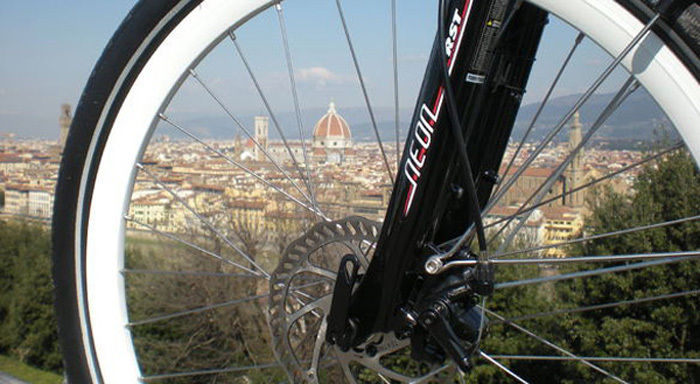 A short ride takes us to Fiesole, a picturesque town of Etruscan origin overlooking Florence and, after a stop here, we’ll continue along ancient and peaceful hill roads to arrive at a delightful farm on the outskirts of the city that produces organic products. Here you can stop to admire the harmonious rural landscape and the splendid Renaissance cloister and, if you like, enjoy a snack (not included) in the characteristic shop selling local products. 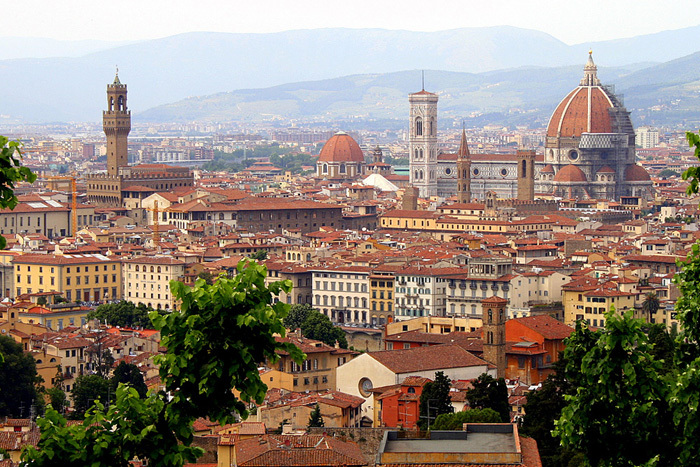 Then we’ll proceed along the route that leads to the famous terrace of Piazzale Michelangelo, where you can stop to enjoy the unforgettable panorama that encompasses the entire city. 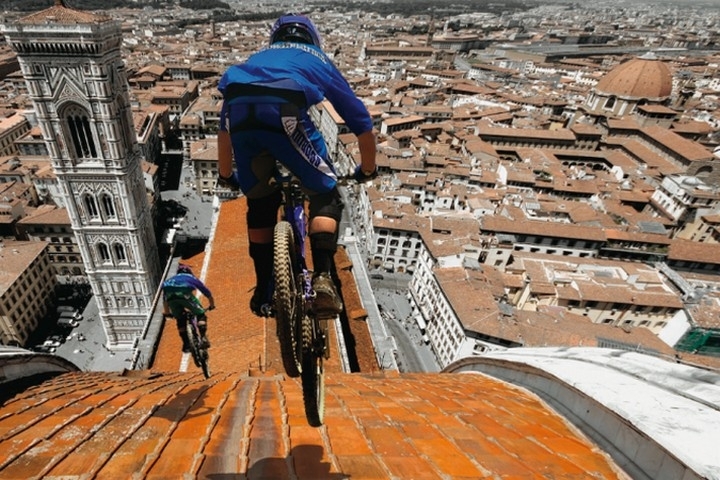 Climbing once again, you can admire the magnificent Romanesque basilica of San Miniato al Monte, and then descend into the heart of the city along a short scenic route that leads to the Lungarni riverside streets. We’ll stop off at a cosy wine bar featuring the wines and food products of the Chianti region, where you will be offered a delicious tasting. Then we’ll proceed to the historic centre, passing through characteristic streets and splendid piazzas, where all the emblematic monuments of the city will pass before you, like in a film, with plenty of opportunity to immortalize them during our photo-taking stops: Ponte Vecchio, Pitti Palace, Piazza della Signoria, the Cathedral with the Brunelleschi Dome, Giotto’s Campanile, the Baptistery with the Porta del Paradiso, the Basilica di Santa Croce and much more.